If the Christmas tree is decorated with handmade ornaments, the Christmas party gets a very special touch, because this particular tree decoration is something not everyone has. Also, self-made tree decorations are the best opportunity to enjoy shared family time during the hectic holiday season on a regular basis. Salt dough as a material for crafting is highly recommended because it is suitable for the smallest family members to create their own pieces. Before the play dough is prepared, the wallpaper paste powder should be stirred into the water. Leave the water set for about 15 minutes. Next add the flour, salt and oil. This mass then is kneaded until a smooth dough is formed, which no longer sticks. In the first step, the dough is rolled out. The dough should have a thickness of about one centimetre. Using the cookie cutters cut out your figures. If there is no more dough to cut out more figures, knead the rest dough once again and once again roll it out. Do the same with the cookie cutter as above until there is really no dough left. With the wooden skewer or knitting needle make a hole in the figures. 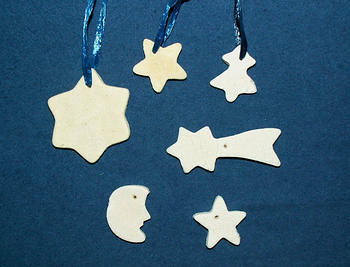 Subsequently, the ornaments need about two hours to dry in the oven at a temperature of 50 to 100 degrees. However, the salt dough figurines can also be dried in a warm place inside the home, such as near the heater. Once the ornaments are dried, a piece of raffia ribbon is pulled through the hole and then knotted. If you want the ornaments on your Christmas tree colourful, you can paint the decorations and optionally finish them with a varnish. This will make them sparkle in the light of your tree.